With Christmas just around the corner, I have got myself organised (well sort of) and almost finished my Christmas shopping. I thought I would give you a sneak peak at what I have got the girls for Christmas. The first thing on the girls wish list was a dolls house and a fairy castle. I do love wooden toys, there is something about them. I decided to look around for a good quality and reasonably priced dolls house and fairy castle. I came across George (Asda) wooden toy collection and was simply taken away. Every item was beautiful. 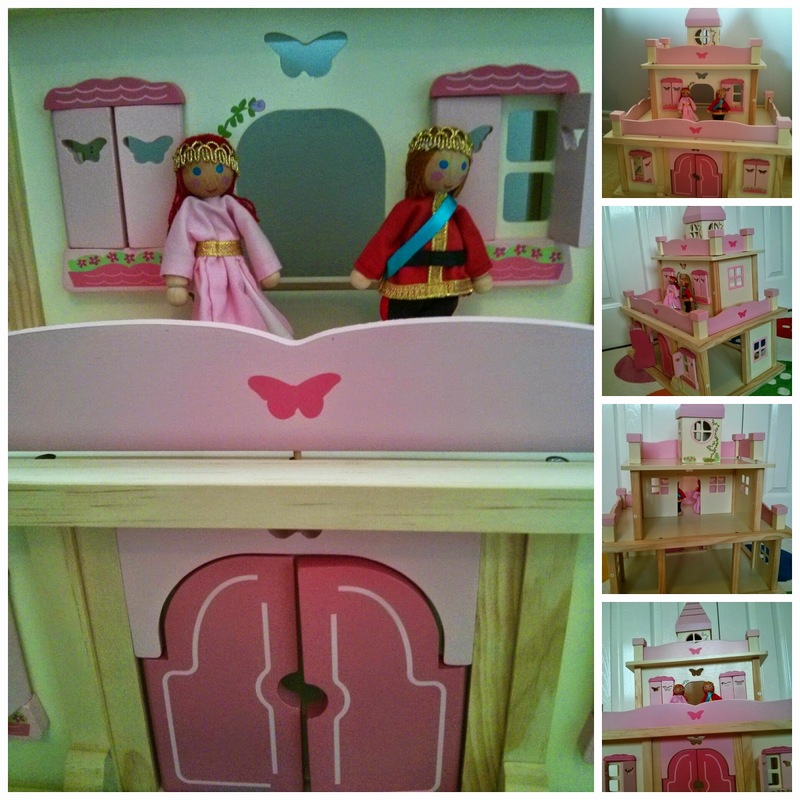 A member of the family has very kindly got them the dolls house and furniture, they look simply stunning and if the quality is the same as the two items I have got for the girls are going to love them. I have got the girls the princess castle, which to me is the same as a fairy castle, and a pirate ship. 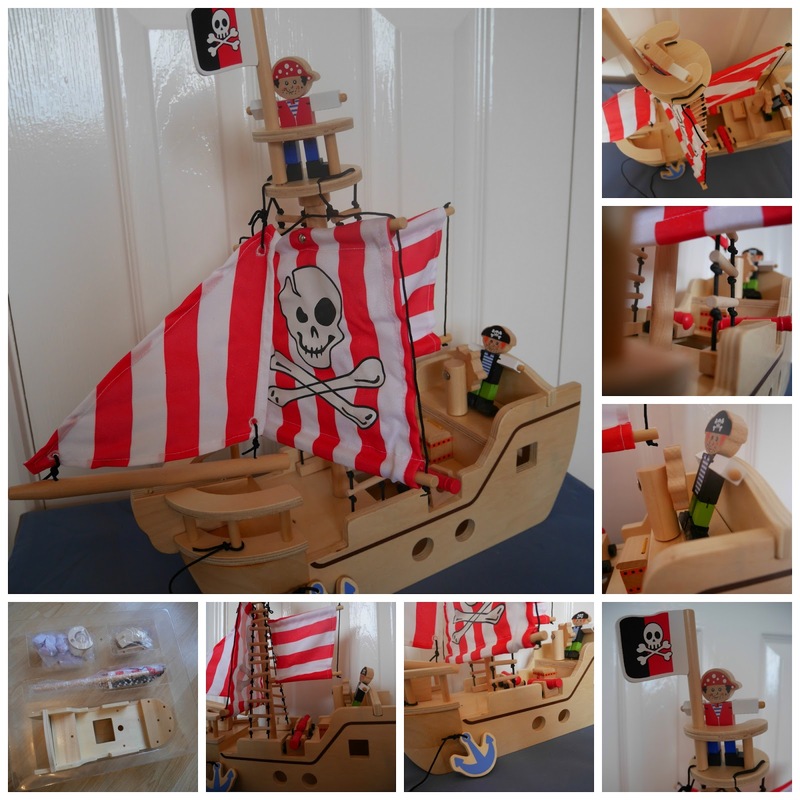 The wooden pirate ship is really easy to put together, it slots together like a jigsaw but is much more sturdy. It comes with 2 pirate figures, 2 cannons and a treasure chest as well as the boat. Given it is priced at £25 I think this is a bargain! I love the details on the sails and that each part of the pirate boat is easily accessible. Both my girls love pirates and whist this is a present for my youngest, it will be something they can play together. The princess castle was easy to assemble but it was time consuming. You do need a screwdriver and there are quite a few pieces to put together. Once it is together it is very sturdy and there are so many different play options. You can access all aspects of the castle, front, sides and back and so play can take on many forms. The windows and the doors open and there is plenty of space on the balconies for play here too. The details on the castle are beautiful, butterflies and flowers. A piece which is sure to last the girls for years to come. I cannot wait to see the girls faces on Christmas when they open the pirate ship and castle. I also cannot wait to play with them with it and watch the magical stories unfold. We were provided with the Pirate ship and fairy castle to review. All words are my own opinion.